Just one week after Christopher Ellis’ extraordinary Damian Marley produced Better Than Love EP, Ghetto Youths International is back with a second Junior Gong supervised taster for another of their stable. 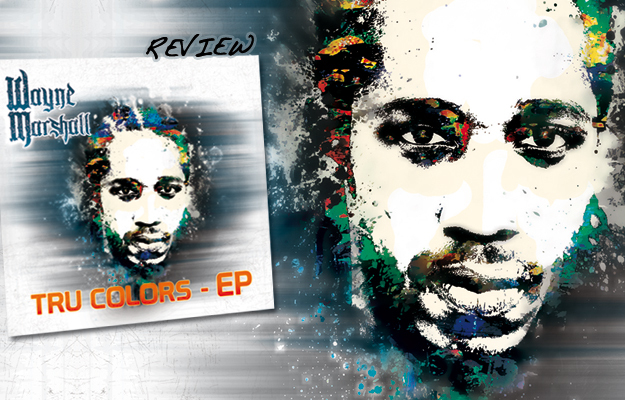 Tru Colors is a five track showcase for the singer-deejay Wayne Marshall - in preparation for a 2014 album (officially only his second despite the first dropping in ’03). Unlike the Christopher EP, where all songs are new, this is a stylistically varied grab bag of rap, reggae and dancehall - comprising fresh tracks, remixes and known hits. The stand-out is the virulently infectious Stupid Money which has been getting pre-release airplay on Irie FM. On paper a dancehall artist recording an ode to abundant wealth on a hip hop rhythm with singing children sounds disasterous. Instead it’s an instant classic – coming on like Jay-Z’s Hardknock Life put to the tempo of Still Dre; and featuring sprightly synth strings, a honking bass sax, rockstone bars from Agent Sasco and a stupidly catchy hook sung by Marshall’s son Giomar. Meanwhile Go Harder is a remix of 2012’s Go Hard piled high with sirens, autotune, pitch shifted vocals and other histrionics. Guest verses come from Ace Hood, Baby Cham and Wacka Flocka Flame – with only the latter’s sounding slightly phoned in. Previously released single I Know is a welcome reminder of the power of reggae. It’s a bleak and rootsy fusion packed with boastful taunts to rivals that Wayne has their envy, their hearts, their territory and their girls. The two non-album bonus tracks are dancehall with a twist. To The Bank has a carnival folk music feel replete with steel pans and banjo. Good Ole Wife on Washroom Entertainment’s 2011 Matrimoney rhythm continues in the pre ska traditions with a banging piano motif. In keeping with the lyrical themes of the EP, even when championing his spouse Wayne can’t resist a boast about number of ladies willing to tempt him away. There have been signs of late that the mainstream popular music market is reaching brag and bling saturation point. Even so, the wordplay and production craftsmanship here are hard to fault.